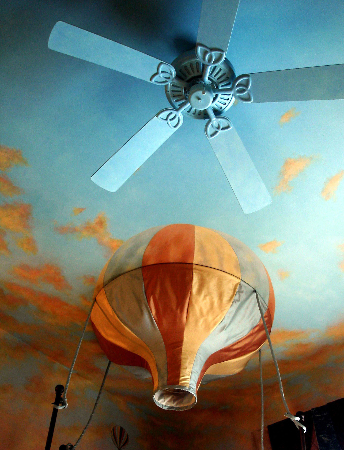 The Sky's the Limit! 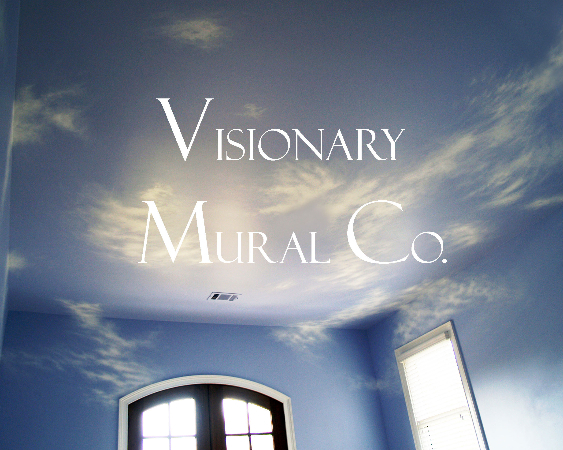 Sky Murals by Visionary Mural Co. 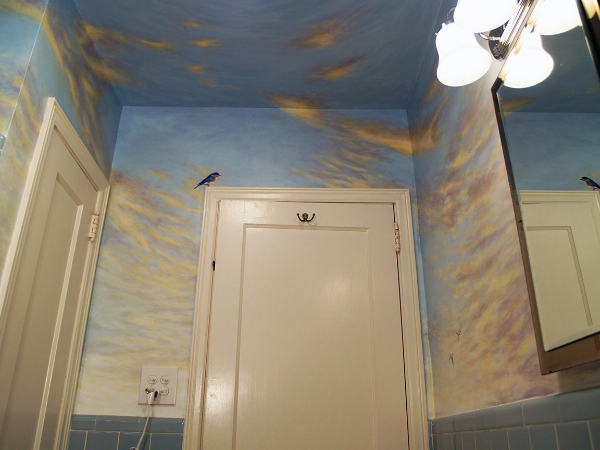 The Sky’s the Limit! 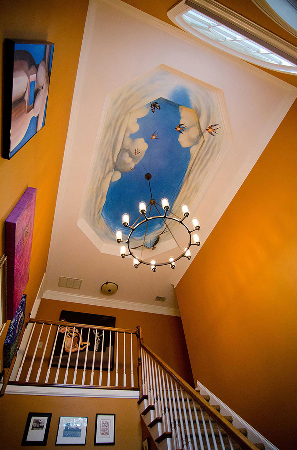 Sky Murals by Visionary Mural Co.
Megan McKeithan of Visionary Mural Co. has been painting murals and commissioned fine art paintings professionally since 1996, including sky ceilings and sky wall murals, all over the Atlanta area and in 61 cities around the country. 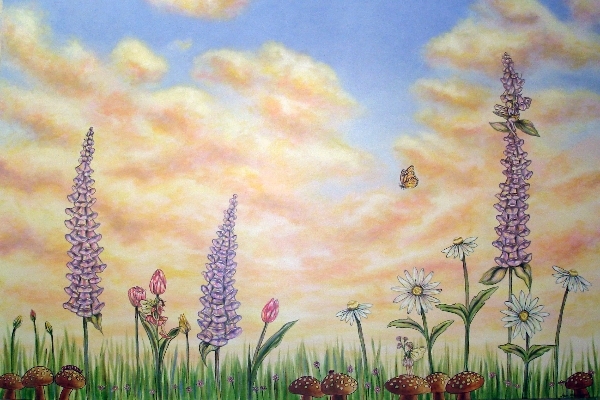 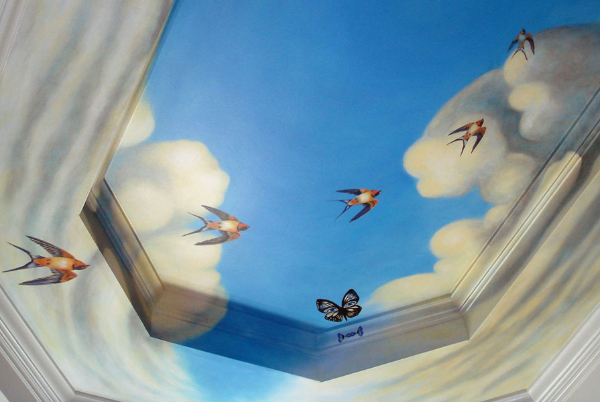 She paints sky murals either directly on the ceiling or walls, or on canvas for installation on ceilings or walls. 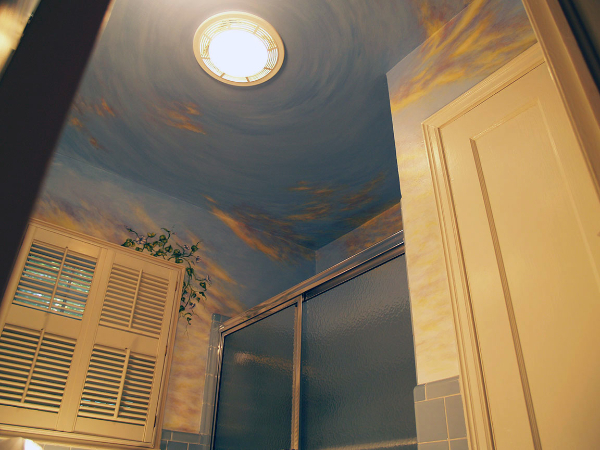 We all live beneath an ever-changing sky. 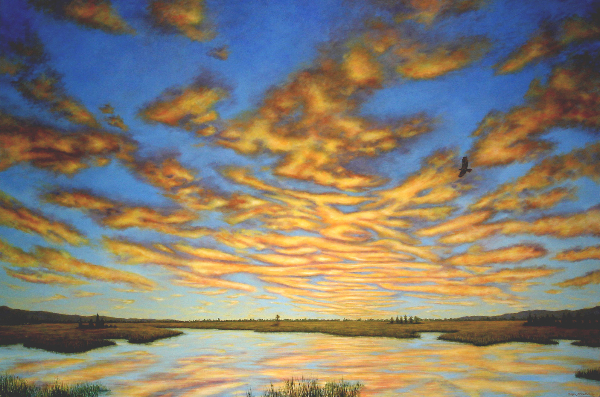 The sky surrounds us and influences our experience in one way or another with its changing light, color, and shadows. 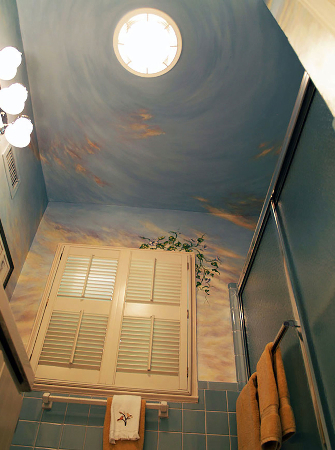 Nothing creates the feeling you want in your room more than painting the perfect sky in a custom ceiling or wall mural. 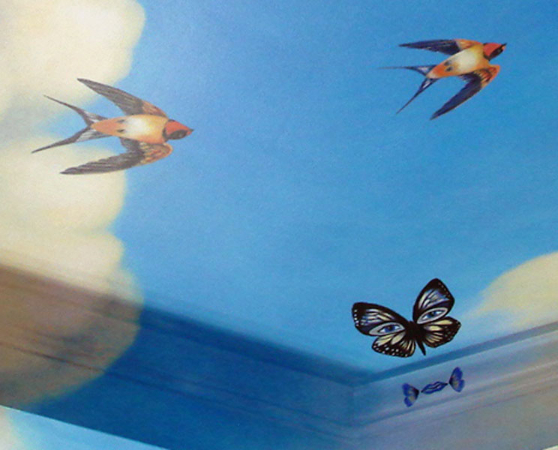 The colors of the sky and clouds, the shapes, shading, and weight of the clouds, and the composition of the clouds on the wall or ceiling, all contribute to the feeling of the sky mural or sky background within a mural. 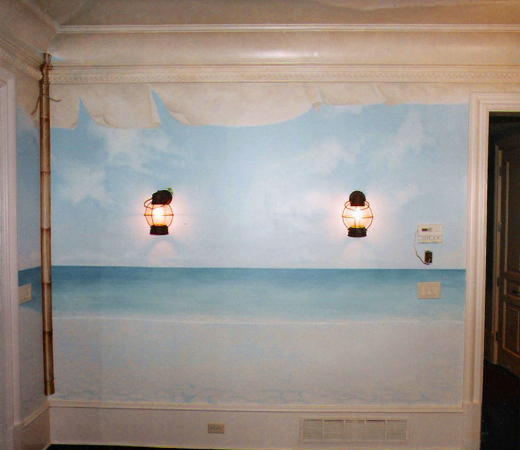 Sky murals can elicit the feeling of calm, relaxation and stillness from the skies we experience and remember or imagine from a beach vacation a day at the lake or mountains. 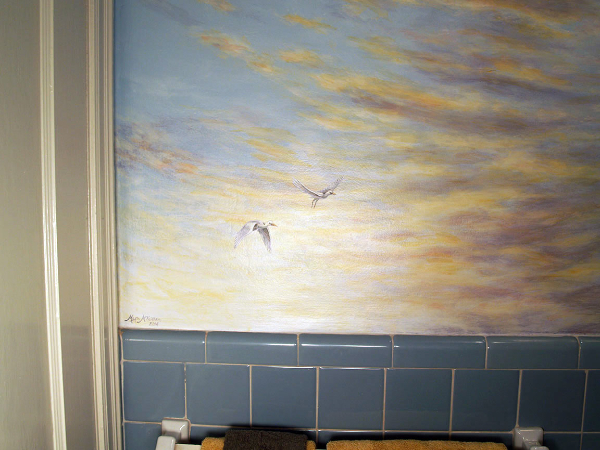 In this mural, Megan updated an old bathroom and selected colors for the sky that coordinated with the color of the existing tile. 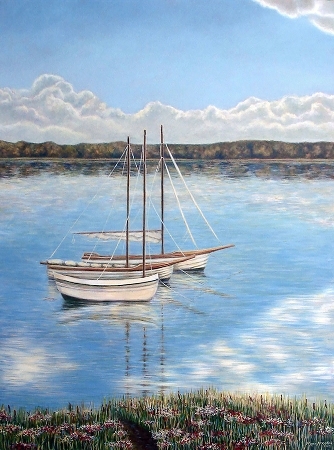 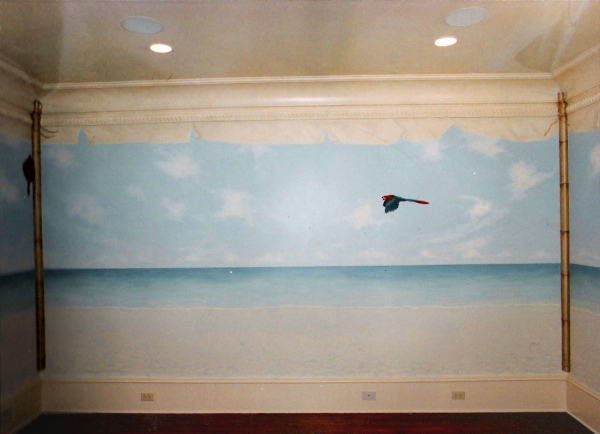 The sky in this mural was inspired by a photo the couple had taken at their lake house in Florida. 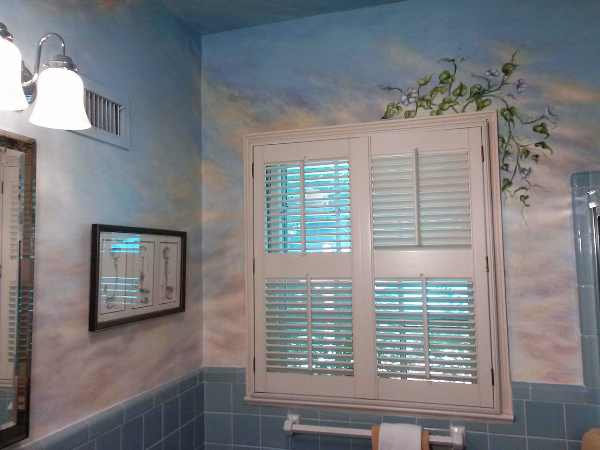 The flowers on the window frame echo those in the art work in the room. 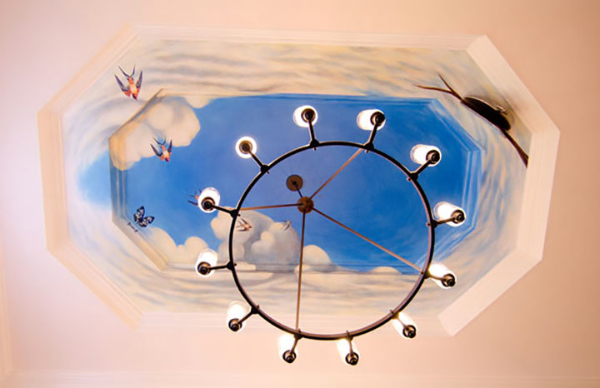 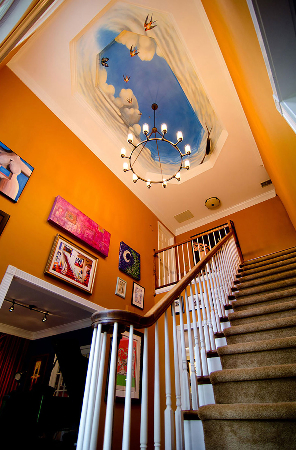 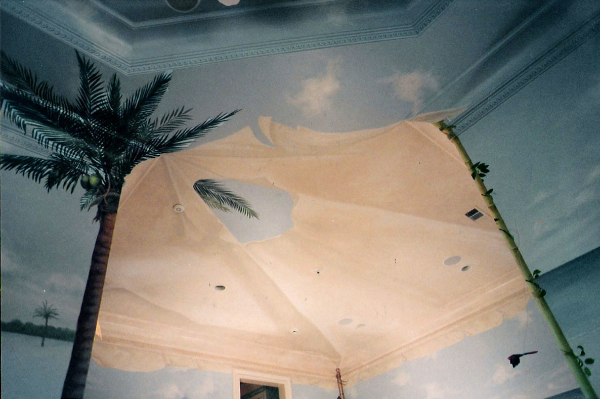 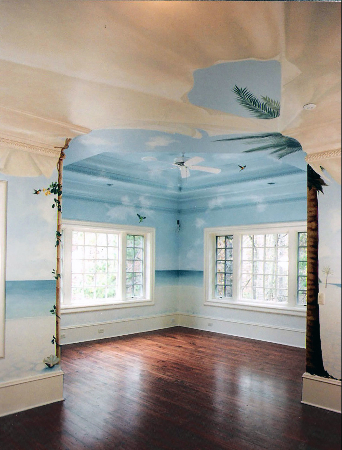 This sky mural, painted across a double tray ceiling, was inspired by several different Salvador Dali paintings. 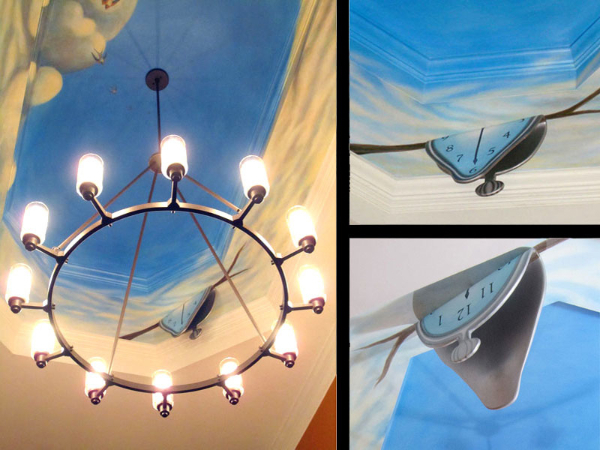 The client’s favorite artist is Dali, so Megan pulled the sky and cloud colors, stylized cloud shapes, butterflies, swallows, and the melting clock from Dali’s paintings to create a custom mural for her client’s foyer. 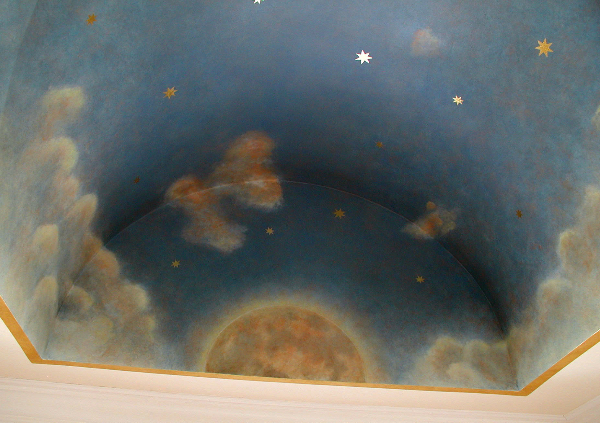 The richness of the blues in the sky and the depth of shadow in the clouds give a dramatic effect to the ceiling in contrast to the white ceiling around it and the orange walls below it. 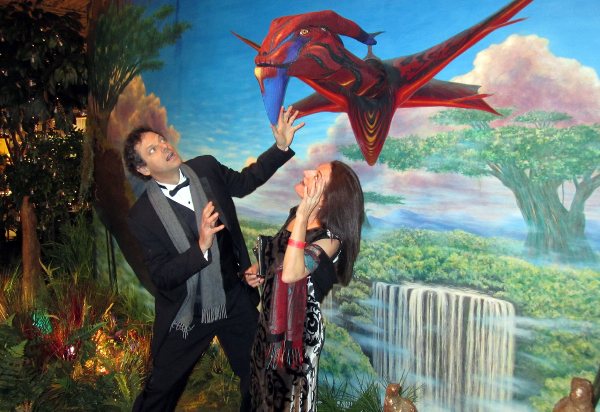 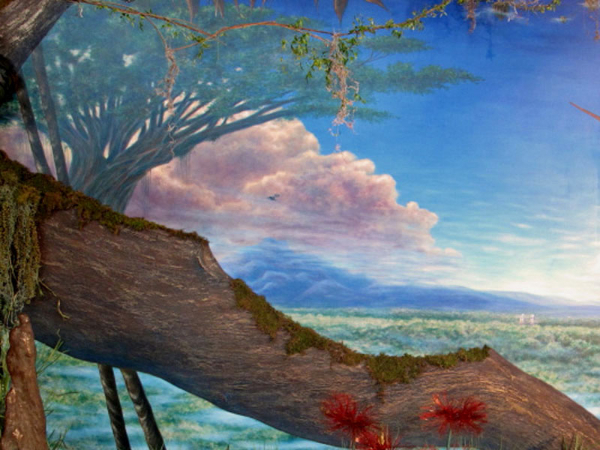 Megan painted this mural on canvas inspired by Avatar for an interior design film event in Atlanta. 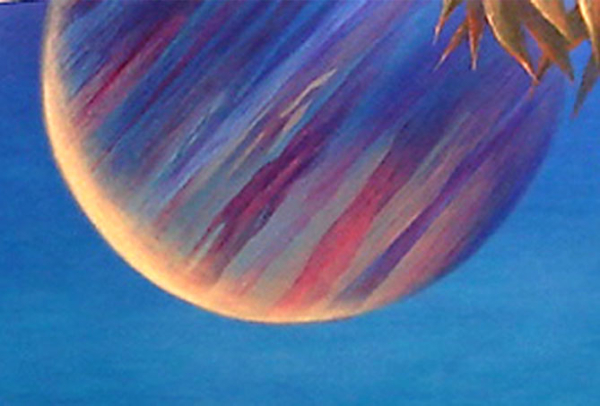 The sky in this mural is intense blue with sunlit storm clouds and the planet’s moon. 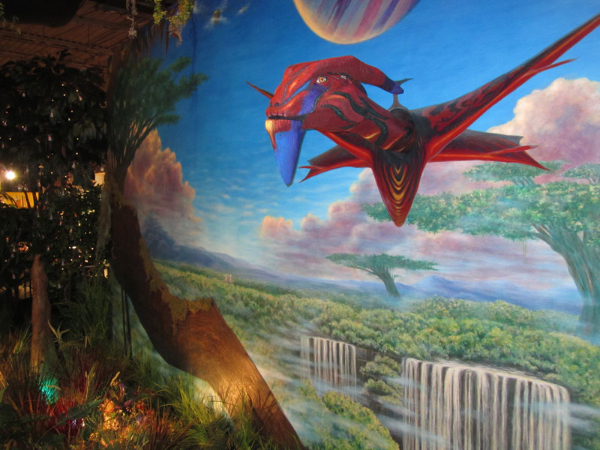 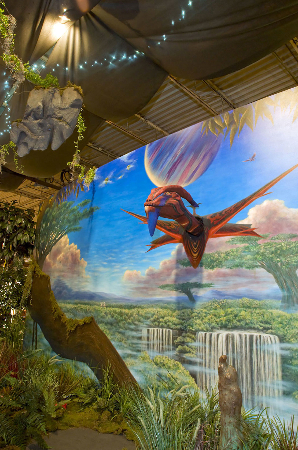 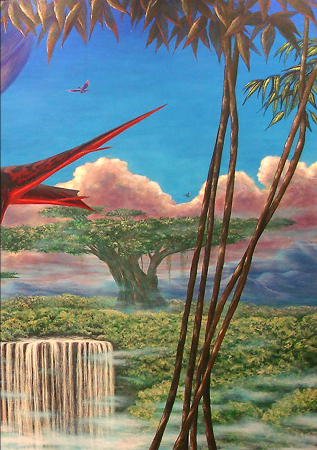 The hanging mountains and Avatar inspired rainforest landscape and 3D flying ikran are all connected by the strength of the colors in the sky. 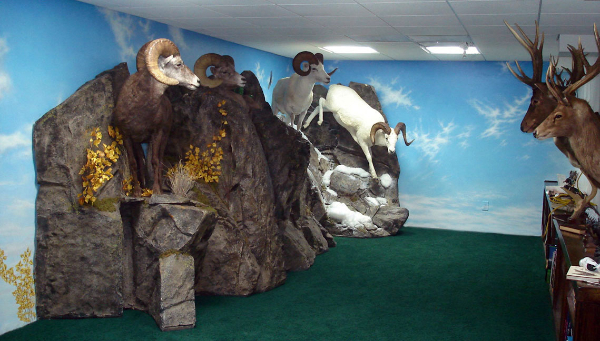 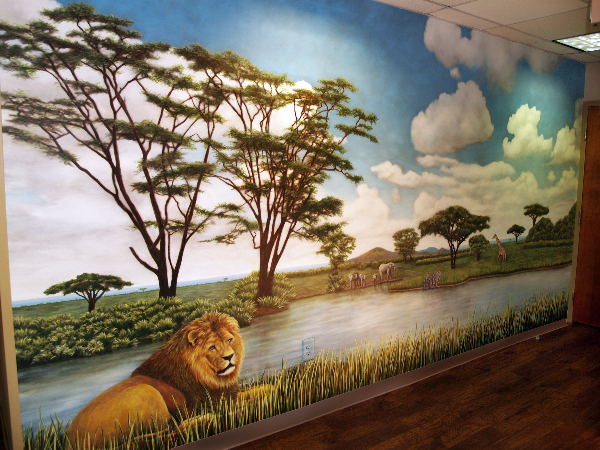 This 10×20 foot sky mural backed an entire 3D installation – creating a complete environment, one of Megan’s specialties. 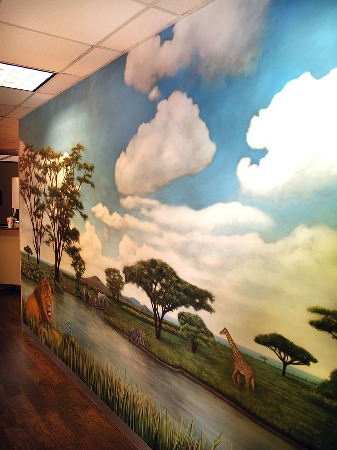 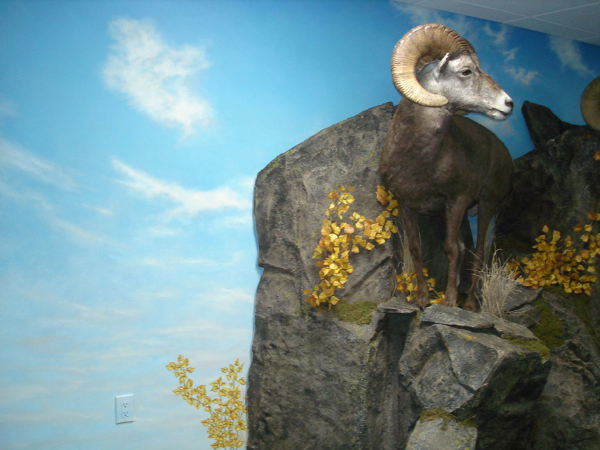 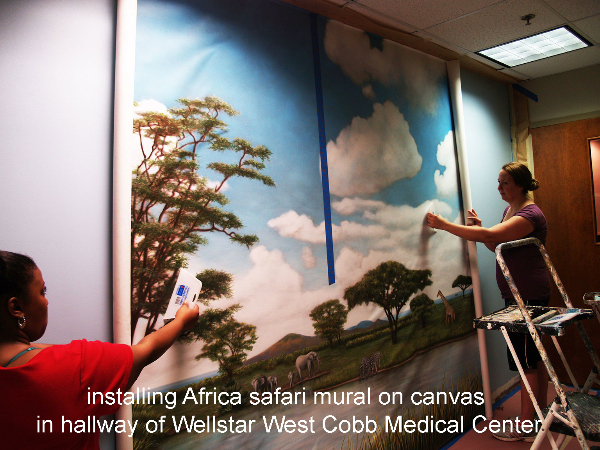 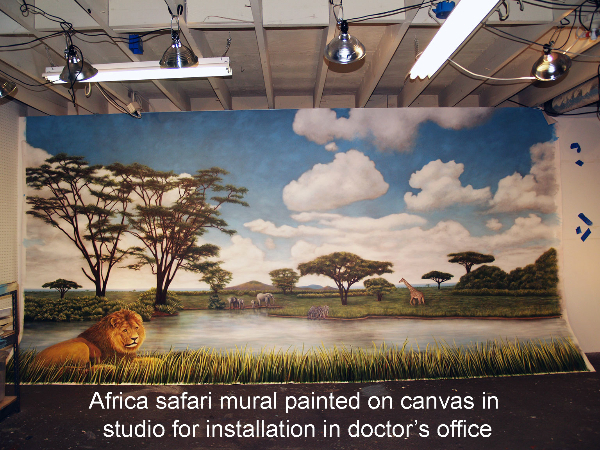 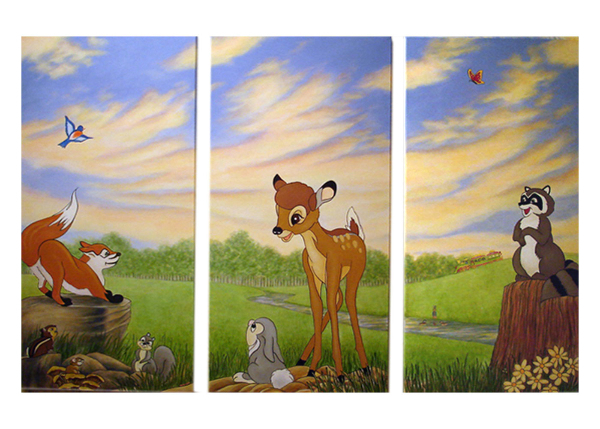 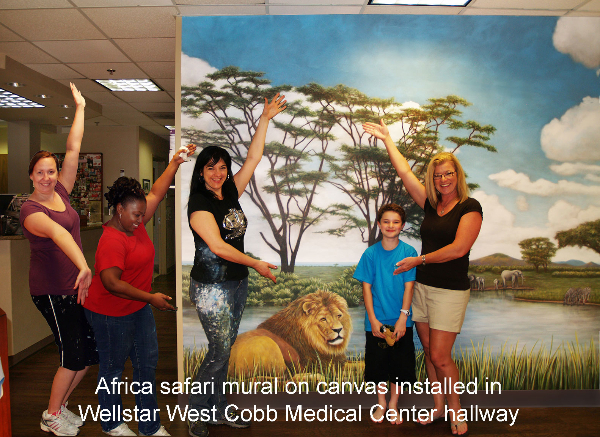 Megan painted this safari mural with deep blue sky for a family practice doctor’s office. 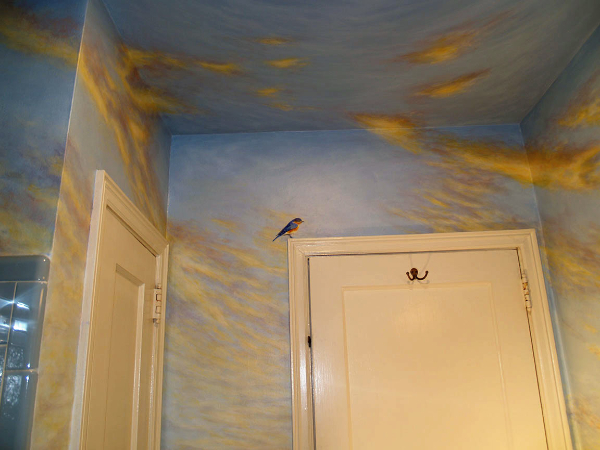 The sky in this mural features deep blue with undertones of darker blue and gray, giving a lot of depth and interest to a tight hallway space. 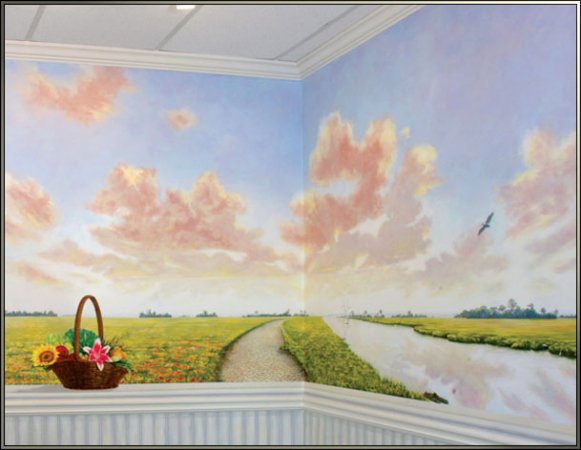 Whether you choose a lighter blue sky mural with wispy clouds and an overall breezy feeling, an intense blue sky with dynamic clouds or a glowing sunrise or sunset sky, you are setting the tone of the your room and your mural. 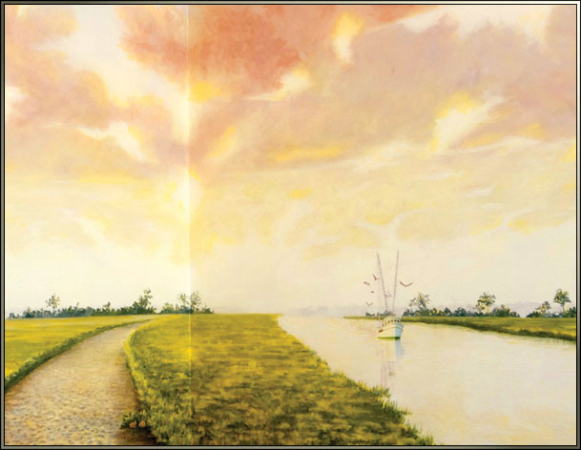 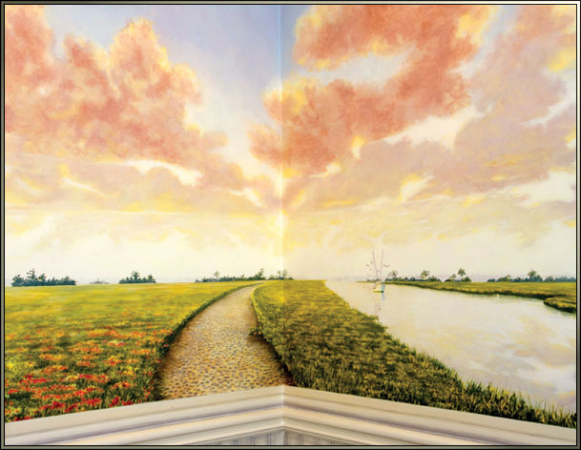 A beautiful sunset can surround the subject matter of the mural and reflect in the water below –adding depth and interest to the mural. 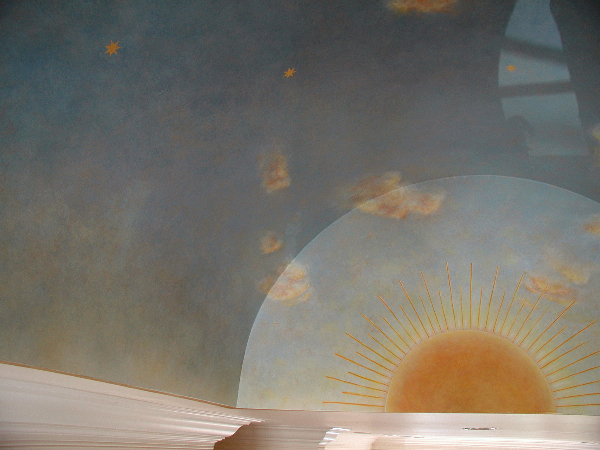 The sacred feeling of this mural is created with the sunlight and white in the sky, along with the reflection of the sky in the pool. 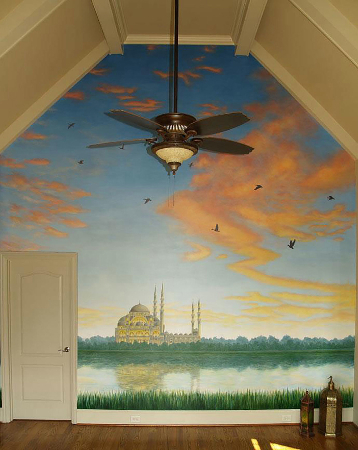 The flash of color you only get for a few minutes over a lake is captured in this sunset sky mural on canvas. 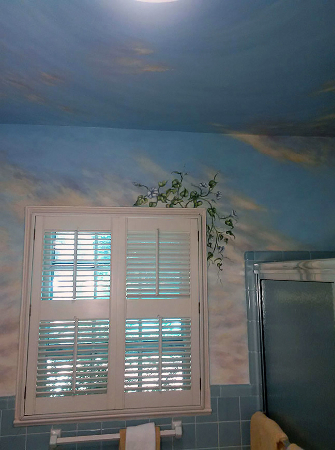 Sunlit clouds in the sky provide a warm backdrop to this child’s mural on canvas. 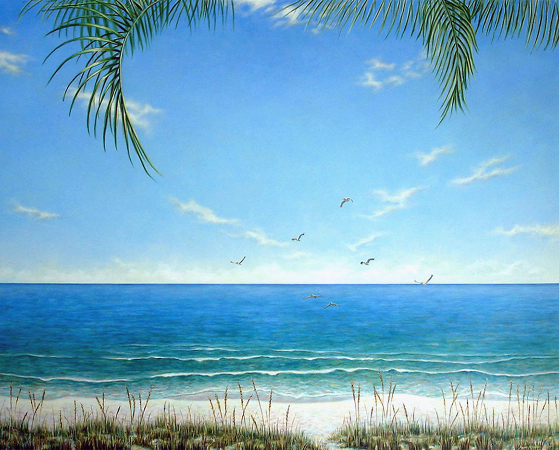 A sunrise can elicit the feeling of a fresh start, or starting something new. 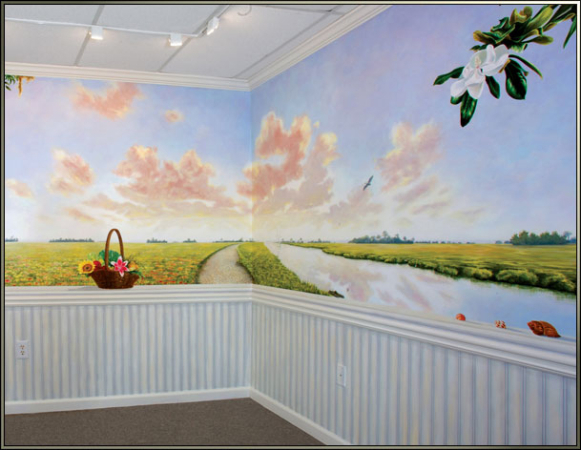 Megan selected a sunrise sky to help create this tranquil setting for the mural in a massage therapy waiting room. 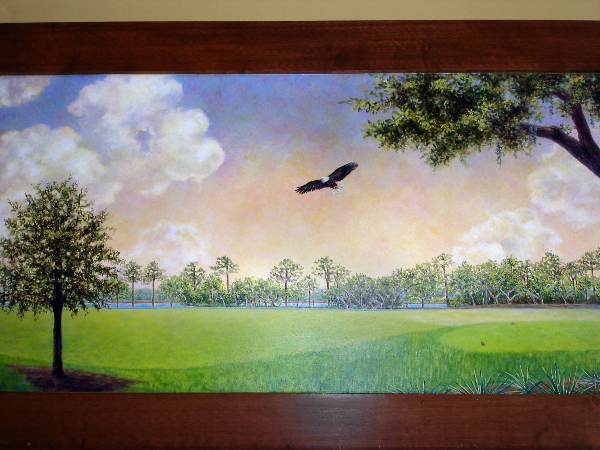 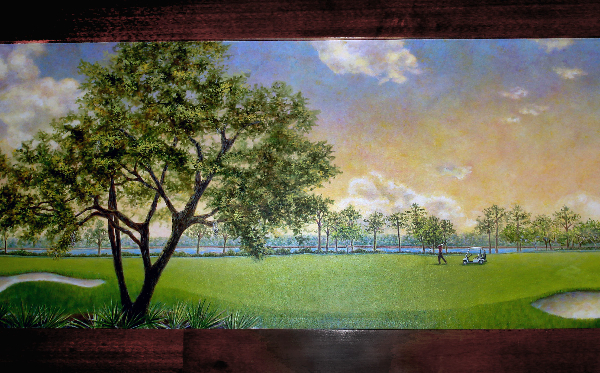 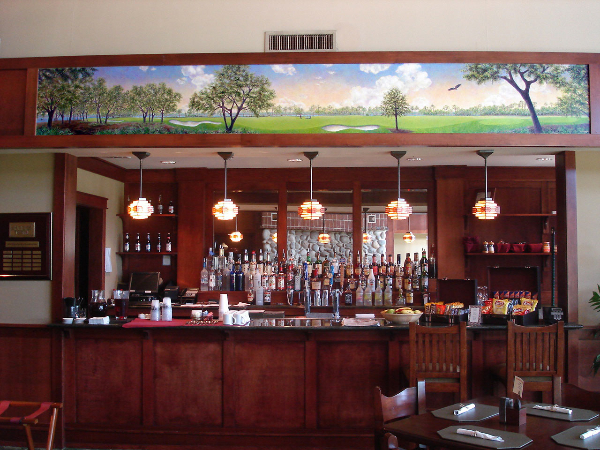 The glow of a Maxfield Parrish inspired sky mural works for this Florida golf course, giving lots of color to the mural and interest in the clouds. 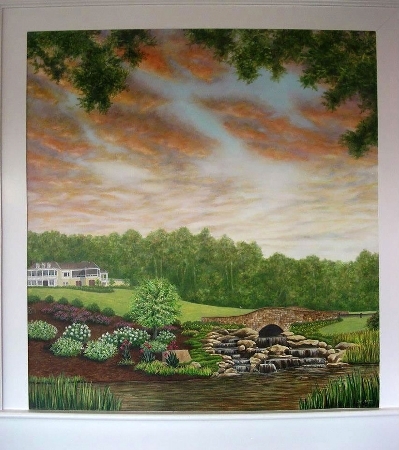 This golf course has gorgeous sunrises every day, so Megan included one she painted as she watched it break across the new waterfall and addition to the club house featured in the mural. 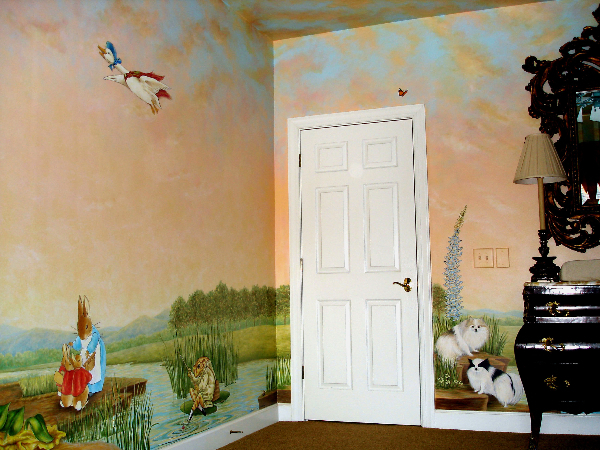 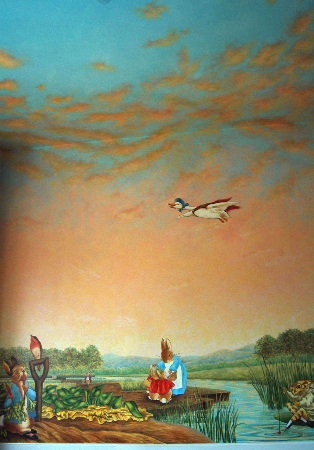 This mural inspired by Beatrix Potter’s Peter Rabbit includes all the walls and ceilings of the room in a sunlit sky. 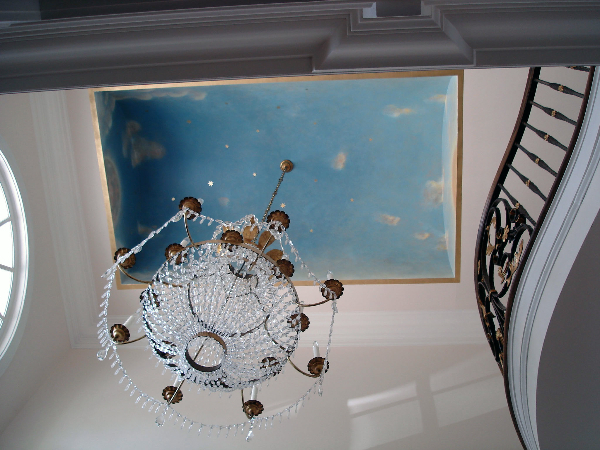 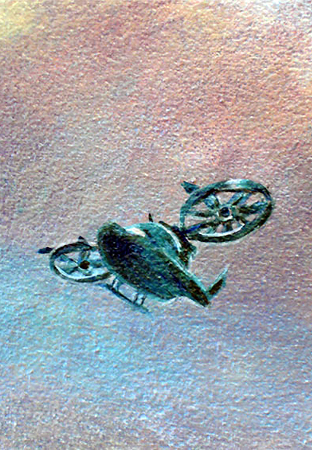 Sky murals do not have to be completely realistic, you can create the illusion any way you’d like to get the atmosphere you want. 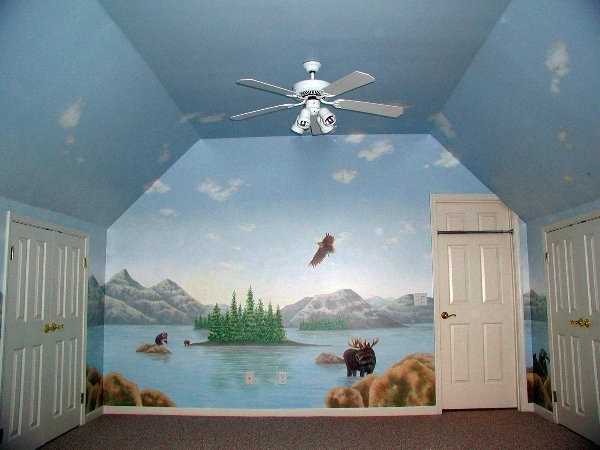 For example in this nursery mural, Megan painted the walls in oranges and salmons then added in blue sky in the ceiling, with the wall colors dissipating as clouds where the ceiling and walls meet . 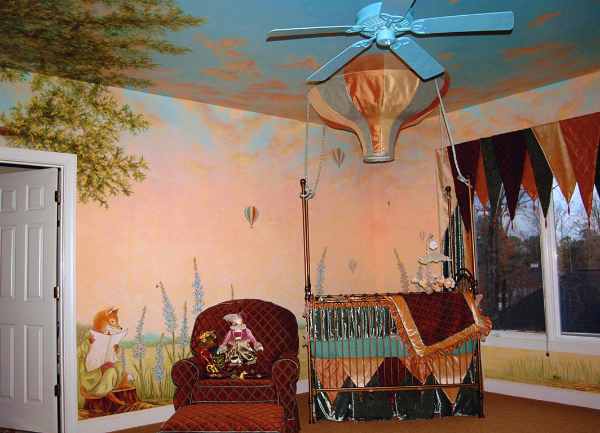 She included the colors from the fabrics used in the window treatments and the hot air balloon canopy for the crib, then painted the top of the hot air balloon as trompe l’oeil into the ceiling. 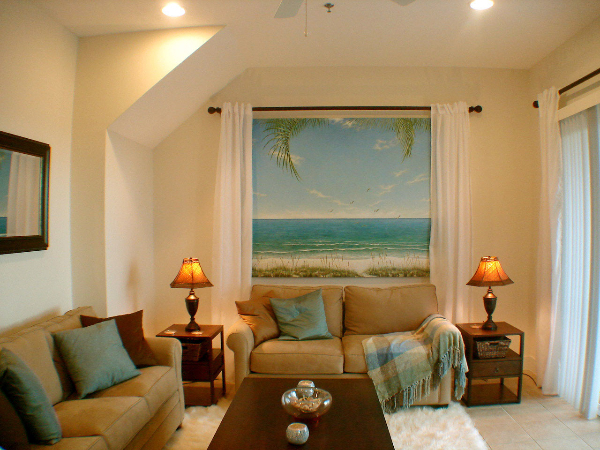 The client got the overall effect she wanted of a warm toned room, but got the contrast and additional depth of the blue sky above the room. 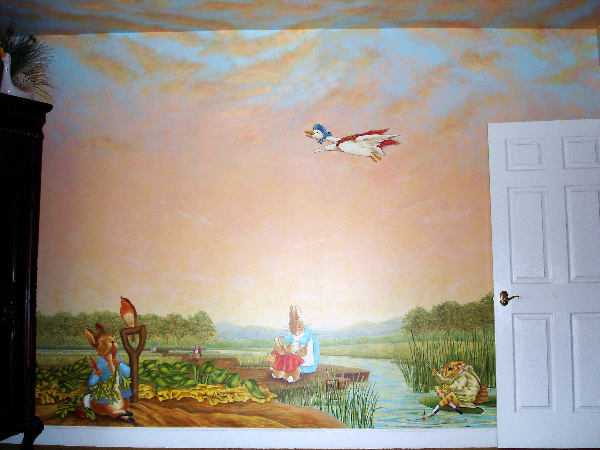 Megan painted this small mural on canvas inspired by Cicely Mary Barker’s flower fairies using a sunrise sky to give the nursery a warm and inviting glow. 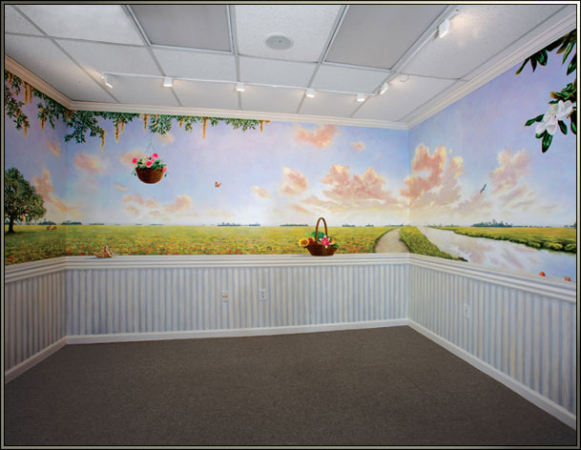 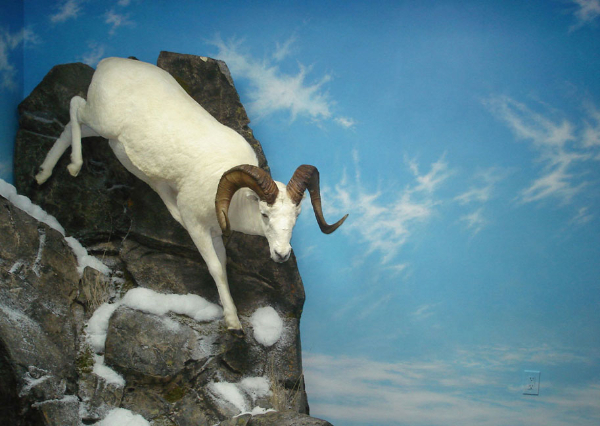 While skies are often the background in murals, they can also be the focus of the painting, depending upon the atmosphere you intend to create with your mural. No matter what colors you have in your room you can always create the illusion of depth and space with a sky ceiling mural or sky wall mural by Megan McKeithan of Visionary Mural Co.
Read more about planning sky ceiling murals in the next blog post by Visionary Mural Co.